This post about rabbit color genetics can help you identify the color of the young rabbits in the litters you raise. Did you have an “oddball” in your last litter of bunnies? 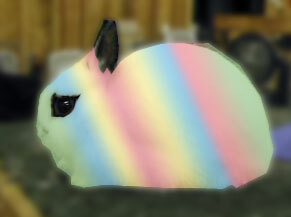 I call rabbits “oddballs” when they turn out to be a color you didn’t expect and can’t identify. Our book, “About Bunny Colors” has a whole section about how to identify the junior oddballs — and here’s a quick checklist to point you in the right direction. [ ] Check the ears—the fur here is short and dense and very useful for telling the color. Agoutis have ear lacing on the outer rim of the ear which is one of the best places to determine the basic (black, blue, chocolate, lilac) color. Agouti and tan pattern markings are easy to spot on the insides of the ears. [ ] Check the eyes—black based colors usually have dark brown eyes. Chocolates often have lighter brown eyes. Dilute colors have blue-gray eyes. Sable and chocolate colors often show a ruby glow to the eye in correct light. If your rabbit has red eyes, it is a REW or a pointed white. Also, all agoutis and tan pattern colors show light eye circles. [ ] Check the muzzle—again, dense short fur and a good place to tell basic color. Nostrils show agouti or tan pattern markings. [ ] Check the triangle—on agoutis and tan patterns, the triangle of color at the back of the neck tells you a lot. First off, if it’s not there at all, the rabbit is a self pattern. If it is orange or fawn, the rabbit has the gene C_. If it’s silver/white, the rabbit is cchd or cchl. [ ] Check the underside of the tail—Sure place to tell a tan pattern Himie (marten)—if tail is not all colored. [ ] Blow into the fur—Normal agoutis show ring color, that is, bands of color on each hair shaft that form rings when you blow into the fur. The middle band of the agouti coat is a light color: orange or fawn on C_ based colors, and silver-white on chinchilla or sablebased agoutis. [ ] Look at the ticking or tipping — On agoutis, dark ticking is a good way to tell basic color. If tipping is light, your rabbit is a steel or a silver. [ ] Is your rabbit shaded looking: darkest on the points and over the saddle and lighter on the sides and chest? Does the rabbit show sepia or smoke tint? Suspect the sable gene. Shows even in agoutis. [ ] Would you describe your rabbit as brindled or having oddly placed dark spots or harlequin markings? Suspect the ej gene. Click the image below to download the checklist!